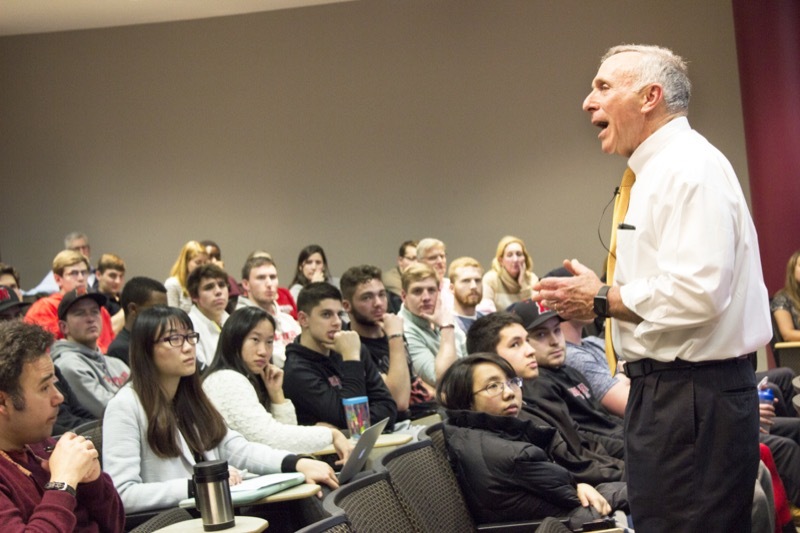 Ron Shapiro '64, the famed sports agent, attorney, author and expert negotiator, knows the power of the effective communication. He's used his skills to negotiate more than a billion dollars in contracts for his clients, which include more Hall of Fame baseball players than anyone else; settle the long-running Baltimore Symphony Orchestra strike of the 1980s; and facilitate bridge-building between Jews in Israel and Arabs in the West Bank via the Peace Players International program in the Middle East. That aptitude with expression even served him well during his undergraduate years at Haverford, during which he beat out five other guys in an election thanks to his public speaking prowess and ability to read a room. "After hearing a number of the candidates talk about recurring themes of good student government and effective leadership, I scrapped my notes and spoke from my heart on the need for us to build relationships and support each other as we face the challenges of freshman year," remembers Shapiro. "Somehow the sincerity of the message and the themes connected with enough fellow students to give me the opportunity to serve as freshman class president." On Thursday, Feb. 4, Shapiro returned to campus to give a different sort of public address, kicking off a new Haverford enterprise in support of the development of student oral communication skills. The Mark and Lillian Shapiro Speaking Initiative, named for Ron's parents, funds one-on-one coaching and peer mentoring, targeted workshops, visiting speakers, and symposia, all of which are designed to help Haverfordians improve their public speaking skills. "Advocating a position to a group, whether small or large, is a challenge that everyone faces, regardless of their field," says Shapiro. "So building skills to be a public speaker is vital to succeeding whether you are a lawyer or agent, a physician or scientist, a writer or teacher, a social worker or fundraiser, a coach or a team member, or any of a myriad of other pursuits." This new initiative supports the development of oral communication skills through all four years of a Haverford education, from first-years learning to participate effectively in seminar discussions to seniors learning to presenting a thesis. The argument and presentation skills students will learn will provide a foundation for internship, fellowship, and job opportunities, as well as for personal and professional development throughout their lives. "I've written these books for a reason," he told the crowd at the later event. "And the reason is that we all face challenges in life, and some of us feel inferior to others because of power, because of culture, because of status, because of gender, and other circumstances that defeat us before we're on the playing field. And I wanted to level that playing field." The Shapiro Speaking Initiative will work to help level that field for all Haverford students, and is designed to supplement the written communication enrichment and development already offered by the Office of Academic Resources and the Writing Center. "I thought that addressing oral communication would help build skills in an area which both complemented and supplemented the development of effective written communication," says Shapiro. "In addition, I happily embraced the building of a skill that has played such a crucial role in opening doors of opportunity for me and also is supported by a program named for my parents who opened the door of opportunity at Haverfod for me."